Leading the pharmacy team at Rome Memorial Hospital is Director of Pharmacy, Scott Burns, R.Ph. Scott started his career at a community pharmacy in Portland, Maine, where he worked closely with patients. That experience made him recognize the impact he had on their lives, which made a lasting impression that continues to drive his work today. A hometown native, Scott Burns returned to Rome to join Rome Memorial Hospital in 2007, first as a staff pharmacist; and within a year he accepted the challenge to serve as Director of Pharmacy. Since then, he’s pushed the boundaries to create lasting change for Rome Memorial Hospital that can be summarized in a few words – the more you simplify your process, the more time you’ll have with patients. 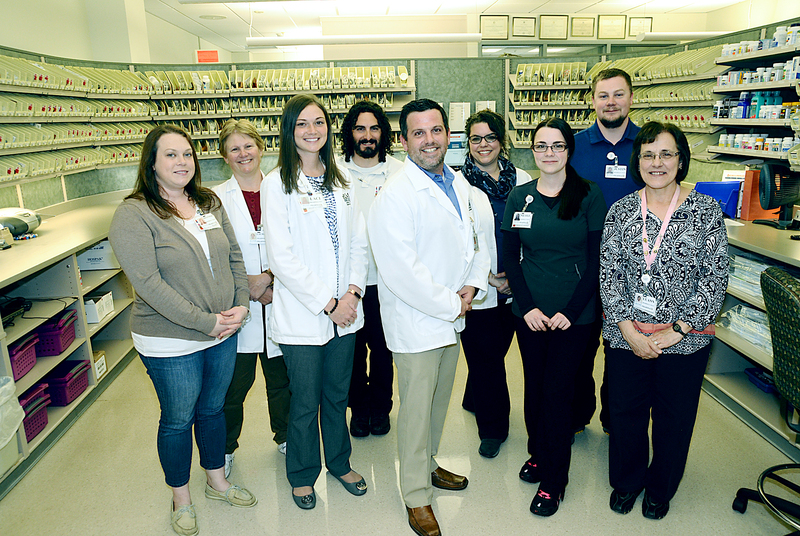 Scott Burns, R.Ph., Director of Pharmacy (center) with the Rome Memorial Hospital pharmacy team. In 2011, Rome Memorial Hospital implemented an electronic medical record, which required around-the-clock pharmacy review, but their pharmacy was only open during daytime hours. The most obvious answer was to add staff to the team to cover the after-hours shift. However, an analysis of the order volume data revealed that this wasn’t a cost-effective option. At the time, telemedicine was just starting to take foot in the US, and Scott was familiar with the capabilities of teleradiology, so he decided to research telepharmacy as a solution. The process raised several questions. How would remote pharmacists communicate with Rome’s team and the clinical staff? Would telepharmacists follow their policies as rigorously as they did? How would they liaise with clinical staff and would physicians have confidence in them? 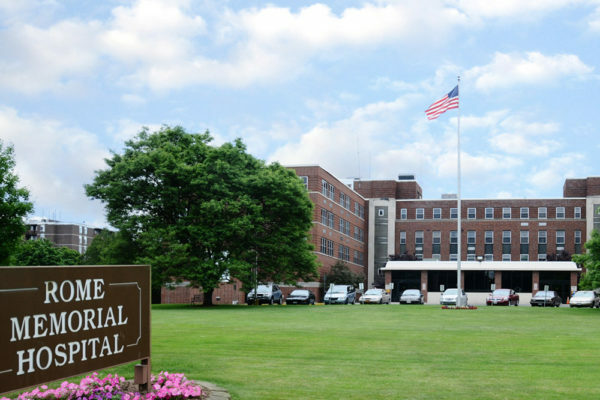 In upstate New York, you’ll find the community of Rome, where residents’ healthcare needs are served by Rome Memorial Hospital, a not-for-profit, 130-bed inpatient facility. The community is home to a thriving senior population, and Rome Memorial Hospital meets this need with an additional 80- bed residential healthcare facility, as well as specialty services for inpatient senior behavioral health services. Their goal is simple and straightforward: To provide quality healthcare with compassion. Scott and team soon got the answers to their questions. Even though telepharmacy was still in its early stages, they discovered that PipelineRx was already serving several hospitals and able to demonstrate the results of their offering. Their approach to telepharmacy was founded on best practices of seasoned clinical pharmacists, individuals who were intimately familiar with the workflows and nuances of the hospital environment. Choosing to partner with PipelineRx, Rome Memorial Hospital had the solution they needed for around-the-clock coverage. The PipelineRx pharmacists soon became an extension of the onsite team and provided valuable insights into solutions other hospitals had discovered. The partnership soon revealed new opportunities for process efficiencies. PipelineRx used a single work queue platform that enabled volume order management for their many, diverse clients. This well-organized and efficient system sparked ideas about what this could do for the Rome Memorial Hospital pharmacy. At this time, the pharmacy was using Pyxis Connect to manage non- electronic orders. While Rome Memorial Hospital is aiming for 100% CPOE, there are always exceptions, such as when an order is taken over the phone or discontinued. However, the screen scrape process for Pyxis Connect was creating duplicate orders: one copy being sent to PipelineRx and another provided locally so it could be entered in the system, among other shortcomings. The cloud-based platform available from PipelineRx was already interoperable with their EMR through the telepharmacy service. Not only would it make order management easier, it would provide real-time insights on order volume and interventions. Additionally, there was no hardware to buy or maintain. After further investigation, Scott decided to make the move to the PowerGridRxTM Essentials software. However, as with many changes, there was some education needed to bring the staff onboard and learn a new process and technology. With pharmacy processes streamlined, Scott could now exercise the opportunity to strengthen collaboration between pharmacy and nursing. A change in senior administration reporting structure further supported this strategy. Goals were aligned, and within six months they realized significant communication improvements that were later proven in increased HCAHPS scores. In 2016, the pharmacy was decentralized and pharmacists partnered with the clinical staff. This combined effort further supported the clinical staff to improve efficiencies in care and cost, and ultimately improve safety. The team continues to expand other clinical programs. Enhancements to antimicrobial stewardship uncovered more ways they could improve documentation and prescribing, as well as reduce cost-per-discharge. Additionally, they’ve opened a contract pharmacy to support a reduction in readmissions through patient medication adherence post discharge. Most recently, Scott leveraged the on-demand telepharmacy option so he could facilitate uninterrupted, twice monthly meetings with the full pharmacy team. The guaranteed time has allowed for meaningful discussions and ensures staff are fully informed. We were able to streamline processes for nursing as well since we now used the same platform as our telepharmacy.